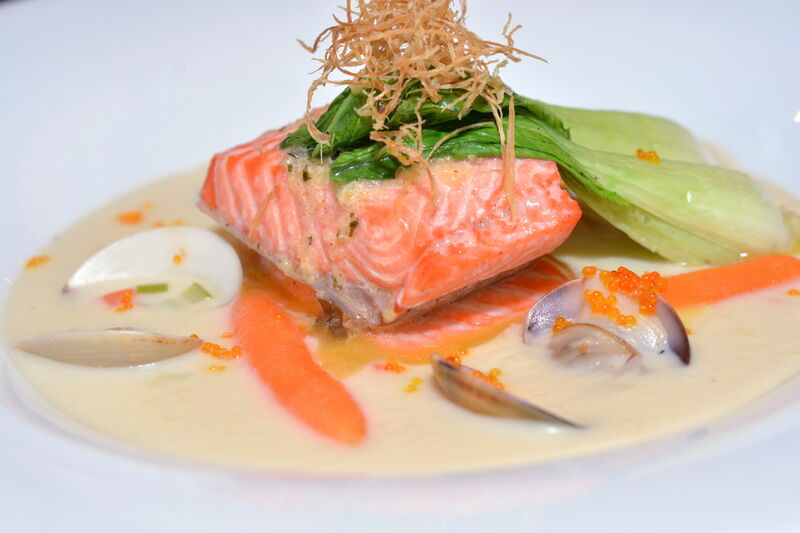 Salmon lovers can rejoice as Zende Restaurant in Seri Pacific Hotel Kuala Lumpur is introducing a Salmon Fest menu throughout April. Although salmon dishes had been previously featured in the restaurant’s promotional menus, this is the first time the restaurant is dedicating an entire month’s menu to the fish. “Those working in hotel food and beverage will acknowledge that salmon is the most popular fish among diners,” said chef de cuisine Mohd Saad Othman, who has been serving as a chef at the restaurant for more than 13 years. “This menu was also created to cater to foreigners as there will be many visitors attending the Defence Services Asia conference, which will be held next door at the Putra World Trade Centre in April,” he said. The Poached Salmon on Creamy Clam Chowder explodes with flavour. 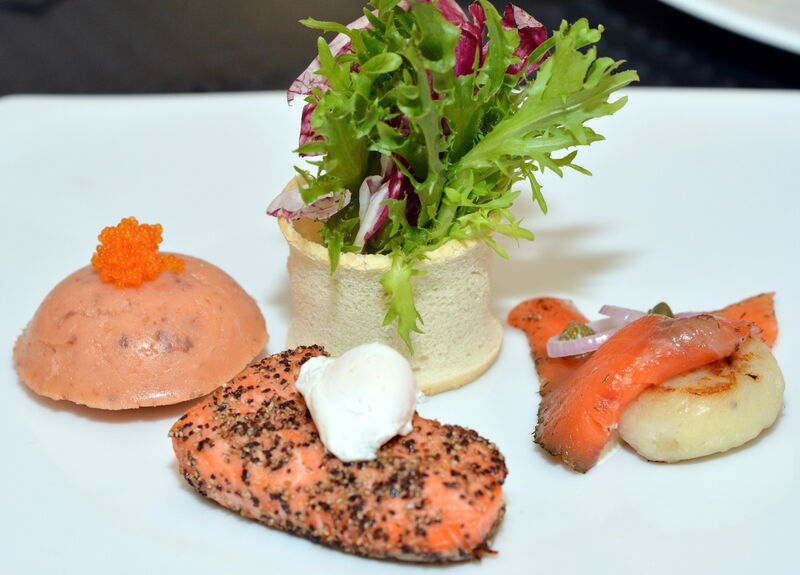 Starting off the menu is Salmon Indulgence, which comprises smoked salmon mousse with caviar, blackened salmon with poached quail egg and salmon gravlax delicately placed on top of a hashbrown potato cake. Priced at RM30, the combination of salmon mouse — with its delectable, buttery texture, black-peppered salmon and the thinly sliced smoked salmon gravlax is perfect as an appetiser. The next item on the menu is the Poached Salmon on Creamy Clam Chowder (RM42). Marinated with garlic herb butter, the salmon is garnished with baby pak choy, baby carrots and deep fried ginger. “The creamy clam chowder sauce basically gives off the same taste as carbonara, but the inclusion of clams enhances the flavour as the clam juice seeps into the sauce,” chef Shaad said. He said his inspiration in creating the Salmon Trout Parcel with Seafood (RM48) came from temari, a popular Japanese sushi. While temari is just a simple rice ball wrapped in smoked salmon, the chef’s creation sees a mixture of prawn, scallop, and mussel contained in a tender salmon parcel, accompanied by forest mushroom, goat cheese, and onion compote laced with saffron cream sauce. Although creative, the blend of seafood is a little overwhelming as the taste comes out stronger than expected. Therefore, this dish is recommended only for die-hard seafood lovers. Meanwhile, the Grilled Salmon Trout on Pesto Potato (RM48) is served with crab croquette, green soya beans, and shimeji mushroom. The roasted bell pepper coulis scented with basil oil makes for a colourful garnish and offers a tinge of sweetness to the flavourful fish, which is seasoned with salt and pepper. Another item on the menu is the Pan Fried Salmon Cake with Stewed Lentil (RM38), which is packed with julienne vegetables, roasted garlic and spiced turmeric cream sauce and fruit salsa. The flaky, melt-in-your-mouth texture of the fish reminds one of the common mashed salmon patty found in a salmon burger. Chef Saad, who specialises in Malay cuisine, has incorporated local elements into the last two items on the menu. The Salmon Fish Head with Lady’s Fingers (RM32) comes with a traditional offering of steamed rice, pickles and papadum served on banana leaf. “This dish is to sate the appetite of diners in search of a more local flavour. I have altered the curry to make it thicker and less spicy,” said chef Saad. Lastly, there is the Salmon Fillet “Portuguese” (RM42), which is a spiced marinated salmon fillet baked in aluminium foil, and it goes with turmeric glutinous rice and belacan asparagus spears. “A lot of time is invested in the preparation of this dish as the fish is marinated overnight to ensure that it is completely infused with the spices and the kaffir lime,” he said. Chef Saad said this dish was his personal favourite, and that the experimental flavours, particularly in the marinade used, gave the succulent fish a refreshing twist. The Salmon Fest menu is available from today till April 30, between noon and 11pm.